The beachfront breeze, smiling faces and gorgeous coffee with a proud Italian base. 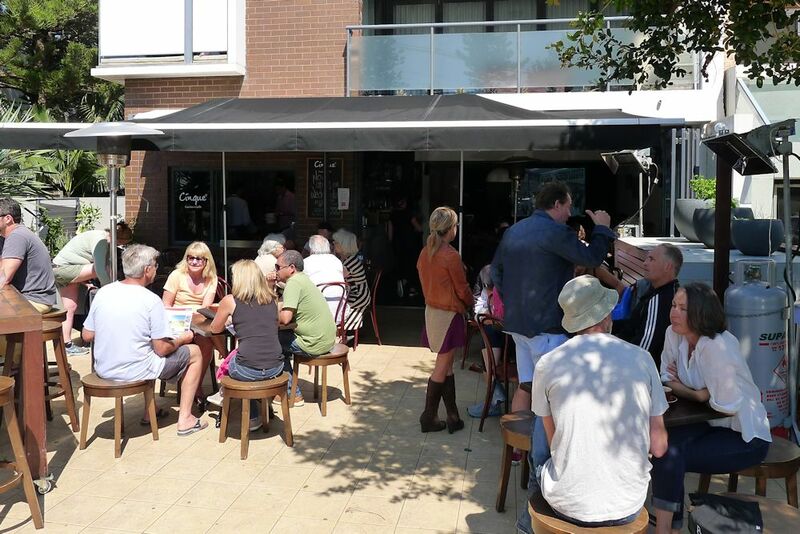 Cinque is seconds away from the beach which is perfect for a cup of quality takeaway coffee. Or if you prefer to sit and relax, the establishment offers a spacious courtyard and simple, refined interior. Breakfast is the only time when bar service is the ordering method but a waiter was happy to take our order seeing as we didn’t know this already. As I said: smiling faces and the staff were all very accommodating. 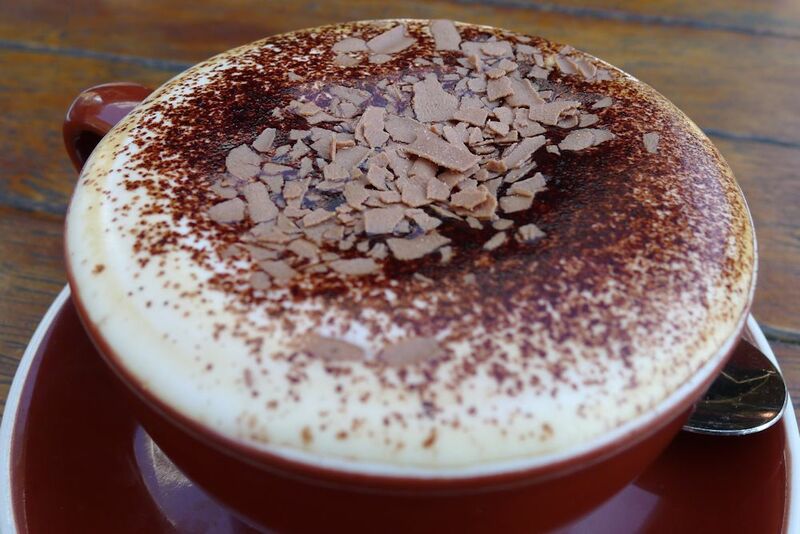 The Little Italy coffee ($3.60) was prepared beautifully including a topping of chocolate flakes. Definitely one of the best cups you can find in the area. The smoothies ($6.50) are available as mango or mixed berries. My mango version was slightly too milky; some more yoghurt to thicken it would have been good. 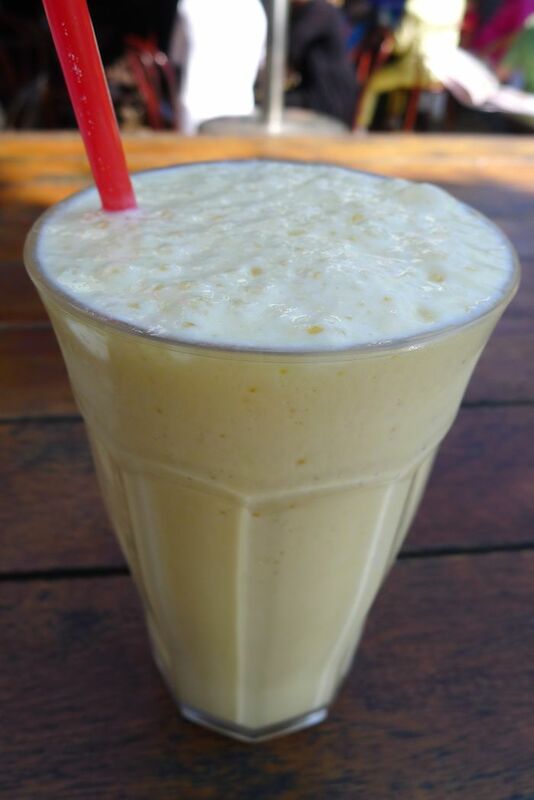 Milkshakes (chocolate, vanilla, caramel or strawberry, $6.50) or frappes (mango or mixed berries, $7) as well as affogatos ($6) or shakerato (shaken espreso with ice and sugar syrup, $3.50) are also on offer. One of the best fruit salads I have sampled for a while. 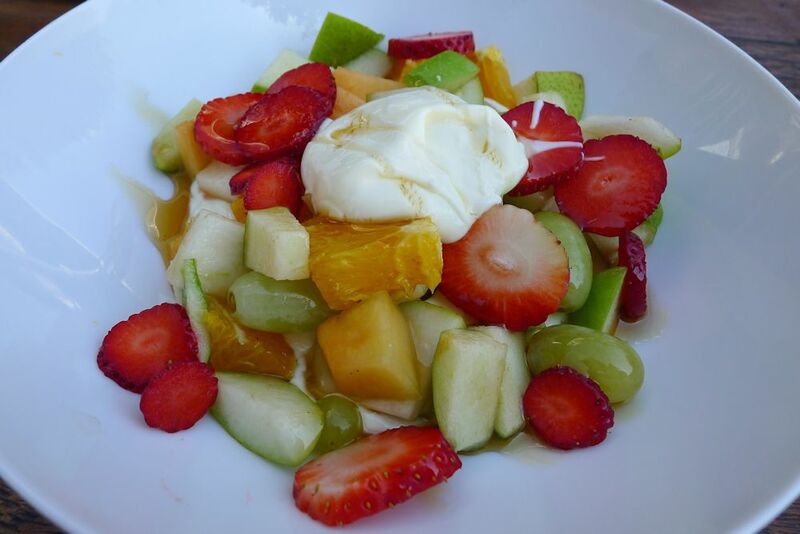 The seasonal fruit salad ($8.50) featured a good variety of ripe fruit and optional yoghurt and honey. The yoghurt was smooth and tasted fantastic. A great dish to share to cleanse the pallet, highly recommended. 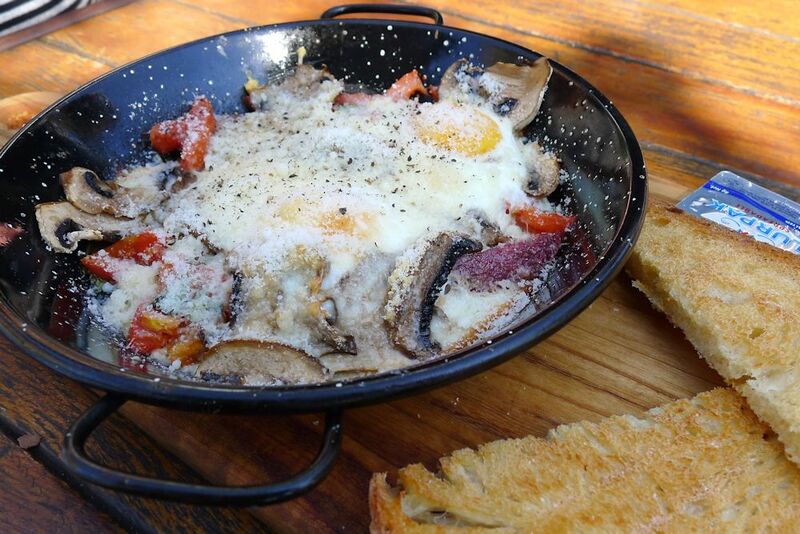 The “Cinque” Uova in Padella ($15) or “eggs in the pan” is Cinque’s version of the ever popular baked eggs. Thrown into the mix was plenty of sauteed salami which was cut thick so it was full of texture and flavour. Mushrooms, tomato and basil was all mixed through and served bubbling hot. If you like your yolks runny, you don’t want to leave it too long though as the eggs continued to cook and while our first one was soft, by the time we reached the second, it was definitely done! Fresh ingredients and a mix of flavors that worked. 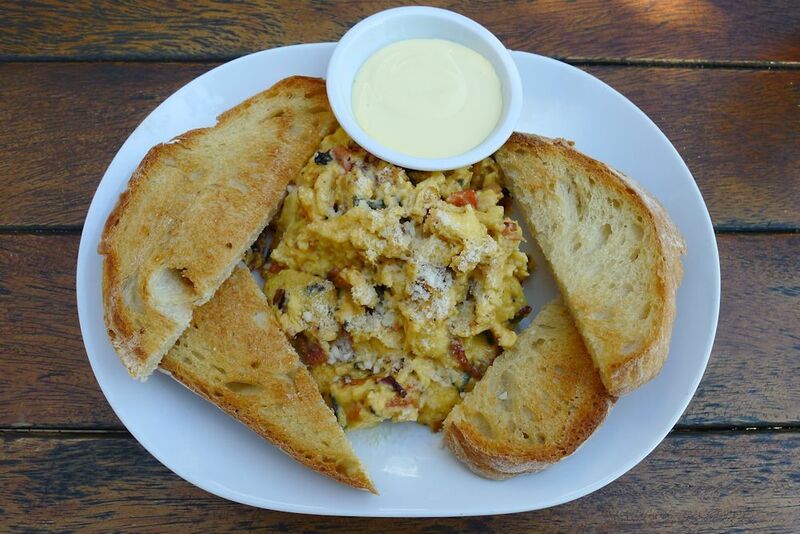 The Italian scrambled eggs ($15) adds some flair to plain old beaten eggs. A healthy amount of pancetta, tomato and basil boost the flavour and the dish is served with sliced sourdough to spread it over. The hollandaise on the side is something I have never seen served with scrambled eggs and to be honest it’s not really needed. Great flavours overall which I think would be improved simply by starting the dish by caramelising some onion in the pan. If it’s a snack you’re after, Cinque has you covered with a large selection of sandwiches and sweet treats. Ciambella (Italian dougnut, $4.50) or bombolone (Italian pastry stuffed with chocolate, $4) are memorable favourites. I certainly intend to return for dinner after reading through the inspired menu and listening to friends who have visited. 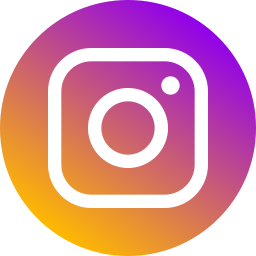 Cinque are expents when it comes to hosting large tables or special events so be sure to inquire in person or on Facebook. Excellent service and the best food ever! Have you got your Cinque Card yet?